The period during the one-and-a-half hours before sunset on every 13th Moon day is a premier karma-dissolving powertime called Pradosham. This Karma-Dissolving Prayer Service will be performed to honor Shiva, the Supreme Archetype of Karma Removal. On this Pradosham day, the Moon will be in Chitra, a brilliant star of learning and enlightenment. This is an auspicious time to release negative, dull karma that interferes with our ability to learn better ways of doing things. The period during the one-and-a-half hours before sunset on every 13th Moon day is a premier karma-dissolving powertime called Pradosham. This Karma-Dissolving Prayer Service will be performed both to honor Shiva, the Supreme Archetype of Karma Removal. The Moon will be in Revati, a star of enlightenment and relationship. This is an auspicious time to wipe away karmas that are blocking light and love. The period during the one-and-a-half hours before sunset on every 13th Moon day is a premier karma-dissolving powertime called Pradosham. This Karma-Dissolving Prayer Service will be performed to honor Shiva, the Supreme Archetype of Karma Removal. On this Pradosham day, the Moon will be in Ashwini, a star of health. This is an auspicious time to release negative karma that interferes with our ability to take care of our health. This Interactive Fire Lab will be performed during Spiritual Warrior Archetype Muruga’s 6th Waxing Moon powertime. Muruga is a specialist in destroying energies that create conflict and generate troubling challenges, both spiritually and materially. Muruga has an ability to inhibit our stupid thoughts. On this day, the Moon will be in Pushya, an auspicious star that gives nourishing and nurturing energy. This Interactive Fire Lab will be performed during Wealth Archetype Vishnu’s 11th Waxing Moon powertime. On this day the Moon will be in Uttara Phalguni, a star of work and charity. Vishnu can energize our work ethic with success and renew our ability to have surplus to share with others. Our respectful invocation of Vishnu on this day brings special blessings for on-going maintenance of abundance and comforts. This Interactive Fire Lab will be performed to honor Lakshmi, the Goddess of Wealth, during her Full Moon powertime of creativity, abundance and manifestation of desires. She will be invoked with Shreem Brzee, an ultimate mantra for spiritual and material wealth consciousness. The Moon will be in Vishakha, a star of courage and luxury. According to Dr. Pillai, Vishakha is one of the billionaire stars. This Interactive Fire Lab will be performed to invoke Ganesha his form as Vijaya Ganapathi. In this form he is known as the “Victorious Bestower of Success” who helps become more resourceful and achieve more favorable outcomes. 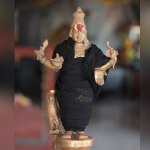 Vijaya Ganapathi can bless us with winner’s consciousness. He is often depicted riding on his mouse, Mushika. This Interactive Fire Lab will be performed during 8th Waning Moon phase, a time to connect with some of the intense qualities of the divine. The Moon will be in Dhanishta, a star of prosperity and music. This fire prayer will invoke Kala Bhairava, archetype of time management, in his form as Swarna Akarshana Bhairava. As Swarna Akarshana Bhairava, he can help us with material gains. This fire prayer will invoke the gamma rays of the Gold-attracting form of Bhairava.